Set in Morelos, Mexico, the son of a wealthy landowner returns to his parents’ home. Upon his return, he falls in love with an indigenous girl named Amorita. The forbidden tryst is entangled with passion and political range as their love story unfolds during the Mexican Revolution. What happens to everyone involved changes them forever. El Pasado Nunca Se Termina (The Past is Never Finished) is a tale of lovers and fighters and is the brand new mariachi opera commissioned by Lyric Unlimited. 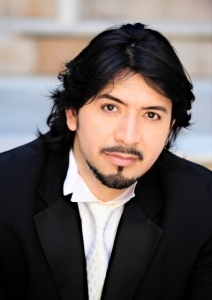 The newest opera reunites José “Pepe” Martínez (music) and Leonard Foglia (librettist/director), who created the successful Cruzar la Cara de la Luna, which debuted in 2013. “I am so excited to be part of such a loving and moving story that I know everyone, no matter their background will be able to connect to the story of El Pasado,” said Puerto Rican native Abigail Santos Villalobos, who plays the protagonist Amorita. Santos-Villalobos revealed she found several similarities between herself and the character she plays in El Pasado. “Amorita is a visionary. She does not allow her circumstances to limit her, or limit the future she envisions for herself. She is strong. She is smart. She does not give into negative thoughts.” For Santos-Villalobos, growing up in Puerto Rico she remained a visionary when it came to pursuing a career in opera enrolling in the conservatory of music in Puerto Rico. “I knew it was the right path for me and I had the support of my family to continue my dream,” said Santos-Villalobos. The acclaimed Mariachi Vargas de Tecalitlán will return to Chicago for the world-premiere performances of El Pasado on March 28th and 29th at the Civic Opera House. Mariachi Aztlán will appear in the preview performances at Benito Juárez Community Academy in Pilsen on March 13th through 15th and at the Genesee Theatre in Waukegan on March 22nd. Tickets for all performances are available now at the following prices: Benito Juaréz Community Academy tickets are $10; Genesee Theater tickets are $10 to $25; and Civic Opera house tickets are $25 to $125. For more information or to purchase tickets, visit lyricopera.org/pasado or call 312-827-5600.